Maxx MX484 is a low-end but stylish and sleek GSM mobile phone launched in India by Maxx telecom. 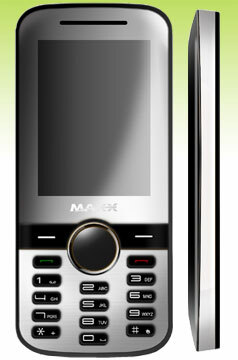 Maxx MX484 is a dual-sim mobile phone, which includes a camera and a music player. This handset supports video recording and has FM too. There are plenty of features packed in this basic mobile phone e.g. it is also Bluetooth and WAP 2.0 enabled. It can be expanded upto 2 GB and phone memory is large enough to store 1000 phonebook entries and 1000 sms. The display is 2.4 inch QVGA, which can display 262K colors. It supports FM radio with scheduled recording. It can operate in Dual-SIM mode (GSM+GSM). It has a digital camera, Bluetooth, Mp3 Player, video recorder and player. It supports expandable memory upto 2GB. It is powered by a 800 mAh battery, which can give talktime upto 3.5 hours and a standby time of 120 hours. HTC EVO a.k.a Supersonic is the First Sprint 4G Phone! Next Entry: Steam for Mac beta Program to Start Soon- Get your application in now!